Our "Neatly Divided" CV template in Microsoft Word sections your personal information to one side of the page and your career/education information to the other - with a subtle dashed line splitting the two. You'll find all the usual sections that you'd expect - a summary to explain who you are and what you're looking for, a careers section for your experience, a space for your education and room for skills, hobbies and references. The CV uses Garamond so make sure you have this font installed for the best effect. Neatly divided free Word CV template	Overall rating:	5	out of 5 based on 3	reviews. Clean, crisp and very well presented - our 'Neatly Divided' theme serves a whole range of different careers and perfectly presents your information for your prospective employers to see. 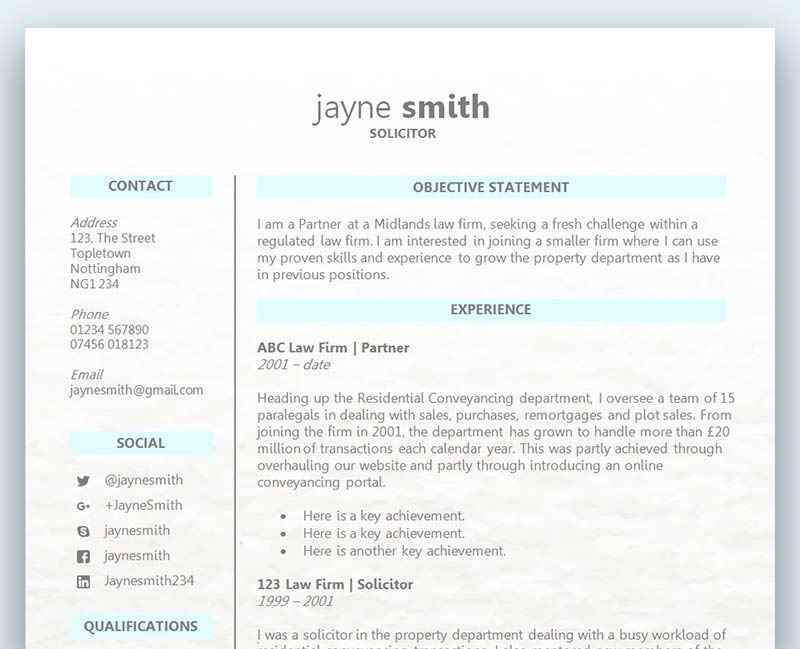 With plenty of white space, your details are easy to read and scan through so you won't get overlooked on that CV pile. The CV template is built using a table so if you need more space, just paste in additional headings - you'll see that the split page layout automatically extends to the next page. We've also used round bullets for the skills list but you can change these if you like - just right click the list and choose 'Bullets' then pick the style you like best. All of our CV templates are super-easy to customise, allowing you to fit them perfectly to your needs. New to this job hunting business? We strongly recommend you read our guide on ‘How to get a job‘. It covers everything from putting together information for your CV or résumé through to finding vacancies, writing a covering letter, how to handle the interview and what to do afterwards. It really is a comprehensive guide and highly recommended, even for those who have been job hunting for some time. We’ve used Garamond on this CV template but it’s very easy to change the font – simply select everything and choose your new font from the drop down. You may want to read our guide on the best fonts to use on your CV or résumé before you decide on a change. Make sure you include all the hard skills you have on your CV – provided they have some relevance to the post. Professionals such as lawyers and accountants still need to use software systems so it is helpful to your employer to know that you’re competent in, say, Microsoft Word, Excel and popular legal/accountancy software packages. Click here for some ideas on hard skills. Always include a covering letter with each job application and tailor it to the individual position. This includes explaining how you meet the requirements of the job advert. See our guide to ‘How to write a winning cover letter‘. If you’re finding that you’re not getting many job interviews, you may want to revisit the contents of your CV and see if it is making the right impression. Give your CV out to a few close friends and family members for their views. Although they may not be professionals in your field, they may be able to spot information that could be viewed negatively, or questions that the CV raises. You might also like to check out our article on ‘How to give your CV the X-Factor‘. We hope you love using our Neatly Divided CV or Résumé template and we’d love to hear your experiences and feedback!